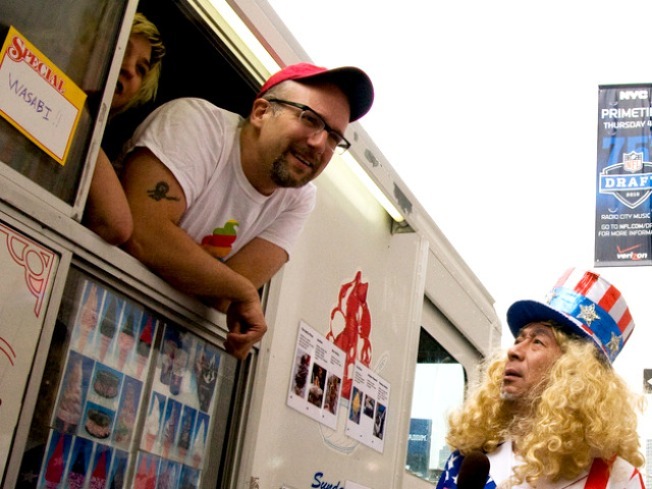 The Big Gay Ice Cream Truck will be on the scene at the Food Truck Fest at the Hell’s Kitchen Flea Market on Sunday. EAT FLEET: Think of the Food Truck Fest at the Hell’s Kitchen Flea Market as the Vendys, but without the interminable lines. (We hope.) The Rickshaw Dumpling Truck, the Bistro Truck and the Big Gay Ice Cream truck (three cheers for soft-serve with olive oil and sea salt) are among attendees. Sunday, 11AM-4PM. SOUL PARTY: When we first told you that Miss Sharon Jones & the Dap-Kings would be coming to the Prospect Park Bandshell as part of Celebrate Brooklyn!, it was just days after her sold-out two-night run at the Apollo in April, and we noted that by the time August rolled around, we’d probably have come down from the high of that show. We were wrong. Badass Brooklyn funkhounds the Budos Band open. Saturday, 7:00PM/gates 6:00PM. SWEEPING: Do not make us go into how brilliant the dark pop of Nicole Atkins is again, people. She’s like Roy Orbison run through a circus-music filter with a sweet glaze of 1960s girl-group mojo, a la Lesley Gore. Just go see her at City Winery, already. Poet-songsmith Simone Felice opens. 9PM. PROLIFIC: MeanRed Productions brings Me'shell Ndegeocelloto (Le) Poisson Rouge for a cozy evening full of the chunky bass notes that have landed her on albums by everyone from Alanis Morrissette to the Rolling Stones (not to mention eight of her own discs). Yep, this the show that was originally meant to happen at the Bklyn Yard, R.I.P. 10:30PM.